Situated in East Gippsland, Buchan is primarily an agricultural town renowned for offering some of the best caving in Victoria. Buchan is a “destination” township as the road from the highway leads up to Wulgulmerang and the Snowy National Park and is not a main though fare. The other road leading out of the township takes you to Orbost via the back road. A picturesque alternative to the Princess Highway. One of the oldest towns in Victoria, Buchan is rich in pioneering heritage and was first settled by Europeans around 1840 after East Gippsland explorer J.R. Wilkinson began the Buchan Station and Edward Bayliss started the Gelantipy Station. 2014 is the districts 175th anniversary year. The Caves Reserve is the main visitors attraction but the district has many other activities and features to take a look at. Visitors information is available at the General Store in the Main Street. Take a tour around the township using this guide and discover the history of the buildings, the river and the people. This tour was developed by Buchan Gallery and the Buchan Heritage Group. Guides are available at the Neighbourhood House, Caves Reserve and General Store. The Buchan River meanders through the township. You can walk along the rivers edge from the swing bridge to the Bluff Reserve, our local swimming hole. The river has good for fishing for trout, black fish and eel. There are picnic tables in some very picturesque spots with the table closest to the swing bridge having a wild plum tree providing tasty plums in Feb and March. You can also do a lilo run from the bluff, getting out at the swing bridge. In times of drought in peak summer the river sometimes becomes unswimable but the caves reserve pool which is feed from an underground stream provides for a cool alternative. 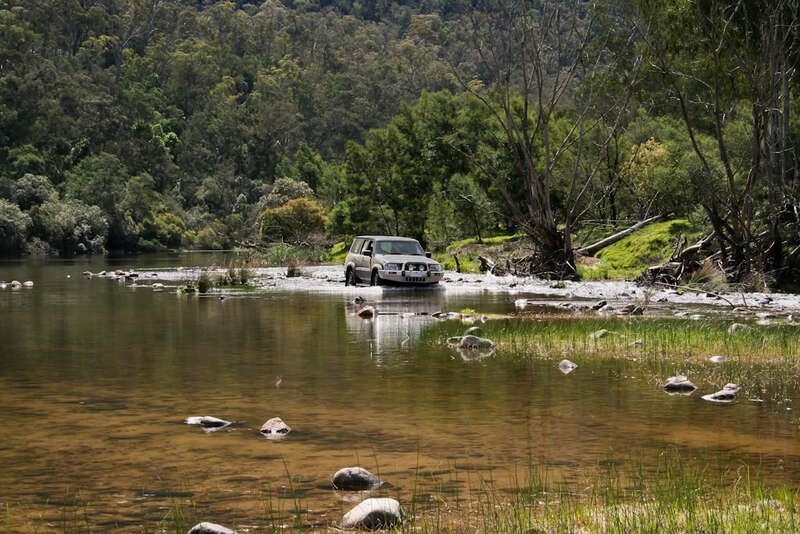 The Timbarra River is an excellent early season river situated about 23 km northwest of Buchan via Timbarra Road. The Road begins about 4 km South of Buchan off the main road. It normally fishes at its best during spring and early summer. Once we get into the hot summer months, the flow drops and the water temperature increases, impacting badly on the fishing. The Timbarra River offers excellent camping with 2 main camping areas at either end of a 5 km section at the brige with smaller bush campsites spread well apart in between. The only facility in the area is a drop toilet and its advised that you bring your own drinking water in and take your rubbish out. Popular spot at Easter time. Other streams worth a look in the district include Livingston Creek, Butchers Creek, Little River and Delegate River. From Buchan you can drive to the Snowy Junction where the Buchan and Snowy Rivers met. Bush camping is available at the junction with basic facilities. There are picnic tables, fireplaces and pit toilets here.When you visit, carry all the fuel, food, drinking water and equipment you will need during your stay. The Snowy River offers thrilling canoeing and white water rafting opportunities with rugged gorges, rapids, flat sections with sand bars and beautiful scenery. The gently sloping sand bars make ideal camp sites for extended trips. The most popular section is from McKillops Bridge to the Buchan River junction at Balley Hooley. This trip takes three-four days to complete. Prepare carefully for any river trip. Consult guide books or speak to the Victorian Canoe Association. Better still, include in your group someone with canoeing or rafting experience or someone who knows the river. Remember to check river levels and weather conditions with the Bureau of Metrology before you leave. Always leave details of your itinerary with a responsible person. Peregrine offer rafting expeditions along the Snowy River which depart from Buchan, tel: (03) 9662 2800 or the Peregrine Travel office in your state capital. 8 km south-west of the town is Buchan South, the site of a black marble outcrop which was used in the construction of 16 huge pillars for Melbourne’s Shrine of Remembrance. 900 tonnes were also shipped to London for inclusion in Australia House. It is also the home of Buchan’s war memorial – the Avenue of Honour. The Avenue consists of two rows of English Oaks planted in 1920 which formed the entrance to the then public school. Well worth a visit -follow the road signs. Stonehenge, in Buchan South, is worth a visit for gemstone collectors. Drive through the tall forests of the Snowy River National Park and see highlights such as the Little River Gorge – Victoria’s deepest gorge – and Little River Falls, a 600 metre-high waterfall. Adventurous types can go white-water rafting down the Snowy River or four-wheel driving to the high country. 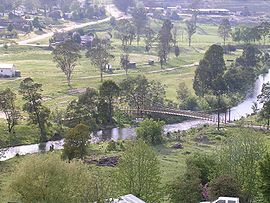 The main camping areas and facilities are situated at MacKillop’s Bridge, although there are also several bushcamping spots and hostel accommodation. From MacKillop’s Bridge are several walking trails including the magnificent Silver Mine Walking Track. Little River Gorge is located in the Snowy River National Park just to the west of McKillops Bridge .After a well-signed 800m drive off Bonong to Gelantipy Road, a 400m walking track leads to a cliff-top lookout. 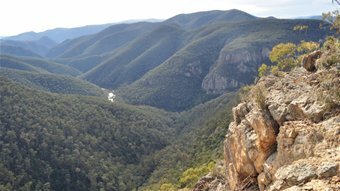 The view from the lookout over the states deepest gorge at 500+ metres deep is dramatic and unexpected and a true must see location if you visit the Snowy River National Park. Comprising of a remote wilderness area of nearly 98,000 hectares, the Snowy River National Park protects Victoria’s largest forest wilderness. The road beyond Little River Gorge into McKillops Bridge is one of Victoria’s most precarious but also offers some truly magnificent scenery as you drop down from the high cliff tops to the Snowy River valley below. Abseiling is also a popular within the park. McKillops Bridge is one of the few places in the Snowy River National Park with access to the Snowy River by conventional vehicle. The descent beyond Little River George is one of Victoria’s most precarious (yet breathtaking) roads: built amongst a spectacular Alpine gorge setting perched high over the river, the bridge provides a wonderful vantage point to admire the majestic high country environment around the junction of the Deddick and the Snowy Rivers. 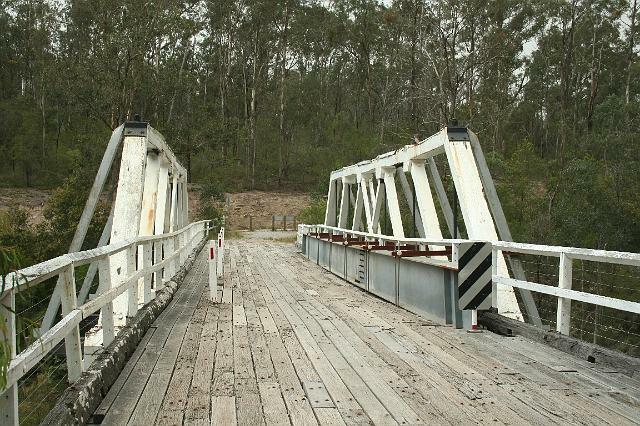 Classified by the National Trust as a structure of ‘Cultural Heritage Significance,’ McKillops Bridge was originally completed in 1936 to replace the previous bridge, which was destroyed by a freak flood. At the time of its construction, the bridge combined twentieth century concrete and welded steel technology with an all-timber stock-bride superstructure of a type that had been built in the 1850s. At this time the structure was regarded as one of the standing wonders of Australian road-bridge engineering. Scenic circular drive to Gelantipy from Buchan. Starting in the tall Mountain Grey Gum forest, this walk steadily descends through a range of different vegetation and finishes on a sheer-sided rocky ridge that overlooks the wild Snowy River and the rugged escarpments around the Tulloch Ard Gorge. On the way, look for lyrebirds, Wonga pigeons and wedge-tailed eagles. Anyone looking for a nice spot on the most famous river of them all…The Snowy River. Then Jackson’s Crossing Campground in the Snowy River National Park may tick all the boxes. 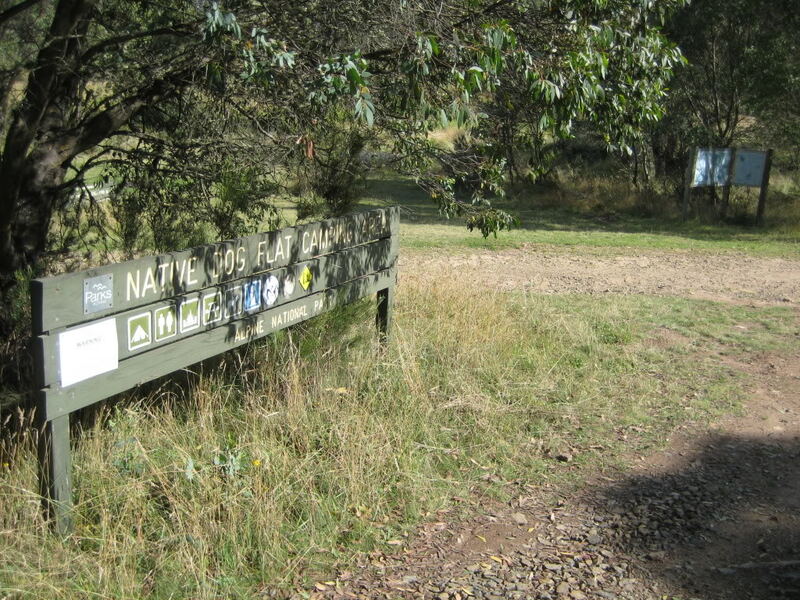 Access to this bush camping site, on the banks of the Snowy River, is via Varneys Track, off Yalmy Rd. A 4WD is needed to reach this isolated spot in the south of the park, although it’s also possible to get here by canoe. There are no facilities – don’t forget to bring drinking water. An excellent brochure by Parks Victoria, Snowy River Drive. Featuring highlights of the remote Snowy River National Park. Spectacular river scenery, deep gorges, waterfalls and magnificant forests. Includes the Tulloch Ard Lookout walk. Launched by Craig Ingram MP on Monday 1st November 2010. 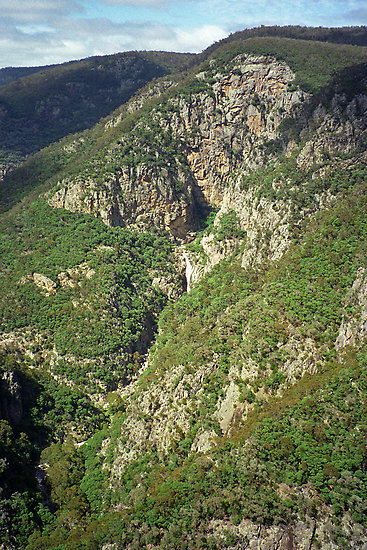 The road north out of Buchan overlooks the Buchan and Murrindal Valleys and leads to Murrindal, the home of the Shades of Death Cave, discovered by Europeans in 1900, explored in 1905 but not permanently opened to the public until 1984. The area is mentioned in an Aboriginal legend which tells of a man who wandered into a cave and met Nyols, tiny people rarely seen by mortals. Further along the road are W Tree Creek, where the river tumbles into a deep gorge, Butchers Ridge, Gelantipy, where petrol, refreshments and information are available and, along an unsealed road, Wulgulmerang. This area featured in Rolf Boldrewood’s Robbery Under Arms (1888). Bushranger, Captain Starlight, is also said to have passed through the region. Old township with historic schoolhouse. No shops or fuel. The Suggan Buggan area is a small farming area that is totally surrounded by the Alpine National Park and is one of the more remote locations in the East Gippsland High Country. Situated on the main road between Buchan and Jindabyne in NSW, Suggan Buggan offers a good overnight camping area for people traveling through the area with picnic tables, fire places and a toilet along side the Suggan Buggan Creek. Things to see in the Suggan Buggan area include the old school house that was built in1865 (pictured at right) as well as the magnificent views to be seen while traveling through the area and the nearby Snowy River National Park. The road north of Suggan Buggan takes you all the way to Jindabyne in New South Wales and follows the Snowy River Valley almost all the way. This is a very interesting drive with the differing types of forest and fantastic veiws of the Snowy River along the way. 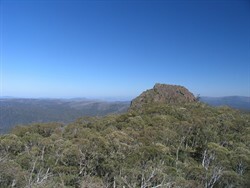 Mount Wombargo is at an altitude of about 1655m above sea level. 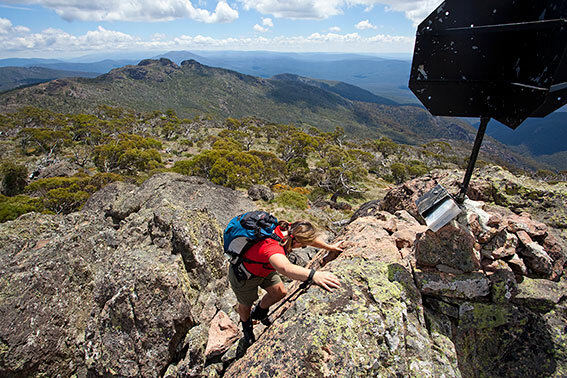 The Cobberas are Victoria’s truly last wild big mountains (Mt Cobberas is over 1800m) and it doesn’t see many walkers. Start the walk from the carpark on Cowombat Flat Track. Climb the ridge from Bulley Creek up to Moscow Peak. The ridge is fairly easy except when you get up to the 1600m mark when you have to do a lot of boulder-hopping. Cross the saddle and climb Middle Peak (1777m) and you will find yourselves in an alpine wonderland. The flowers around Christmas are literally knee deep and the 2003 fires had missed many of the old twisted snow-gums which are a feature of the area. A bloody good outing however and one which will appeal to experienced walkers. Take the Orbost back road from Buchan. 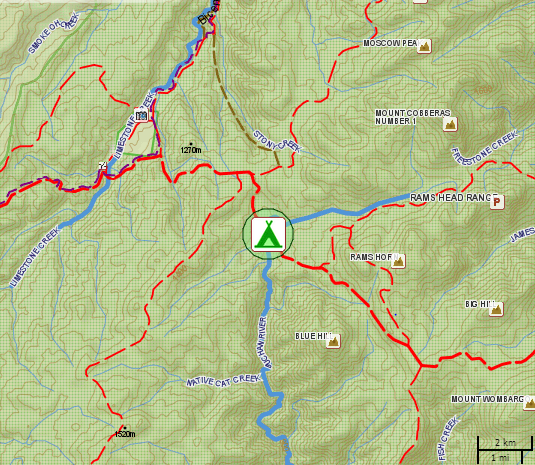 Take Monument Track and Tower Track to Stringers Knob Historic Fire Tower. 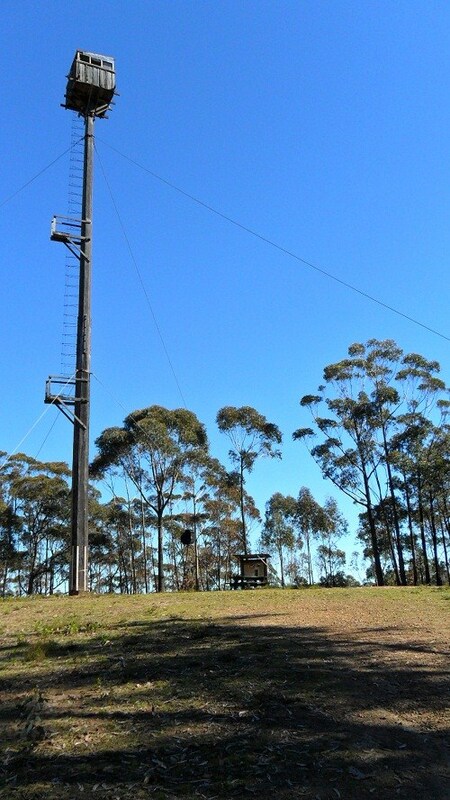 This experimental single pole fire tower was built in 1941 following disastrous bushfires two years before. The fire spotter’s cabin is perched atop a 28-metre pole made of two massive logs (red iron bark and yellow stringy bark trees) spliced lengthwise. The route also takes in Mottle Range Flora Reserve, home to the only known naturally occurring stand of Spotted Gums, Eucalyptus maculata, in Victoria. Warnings: Log truck traffic. Watch out for cyclists. The Bataluk Cultural Trail extends from Sale in the east, through Stratford, Mitchell River National Park, Bairnsdale, Metung, Lake Tyerss, Buchan and Orbostt to Cape Conran in the west. It follows the trails and trading routes of pre-colonial days and focuses on elements of Koorie history and culture, including Dreamtime stories, traditional lifestyles, the Den of Nargun, Legend Rock, Aboriginal Keeping Places, archaeological sites such as canoe trees and shell middens (some dating back 10 000 years), cultural centres of the region, and aspects of European invasion, colonial settlement and present-day existence. At Buchan the focus is on Buchan Caves. Unsealed back road between Buchan and Ensay. Take the Buchan South Turn off to Buchan South and then Quire Road (Buchan Soeuth/Ensay Road) and follow the signs to Ensay. Beautiful countryside with sheer drops to Mount Elizabeth. High country, wild horses and fishing in the upper Buchan River. Camping area in the Buchan Wilderness about 45km east of Omeo on the Limestone Rd. Flat and grassy with howling dingos and frisky brumbies at night. 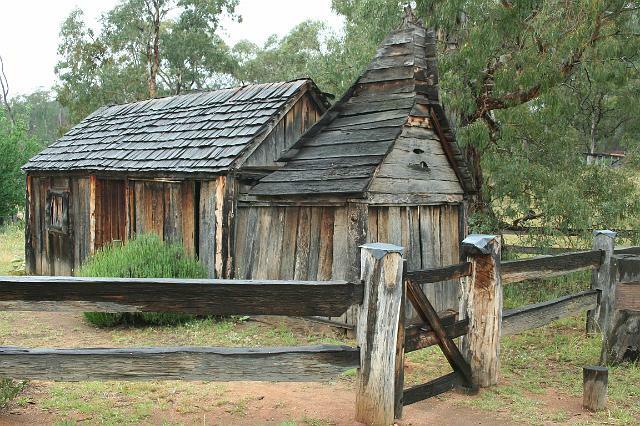 Use as a base to 4WD to Davies Plain Hut, Tom Groggin or along the Cobberas Tk to Forest Hill and the historic border cairn at Townsend’s Corner – the source of the Murray River. 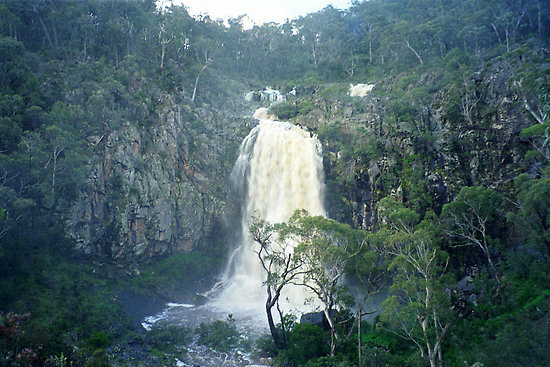 Basin Creek Falls, 15km east of Buchan. 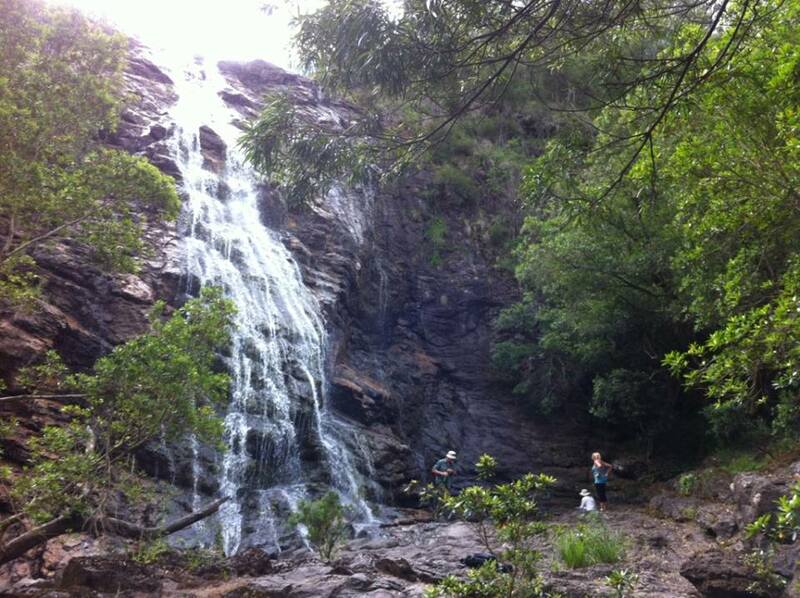 A 1 hour walk from a picnic area down to the junction of Basin Creek and Snowy River. Also great place for a swim in the Snowy River. Parks Victoria have just completed some track work thus walking is now easier…..